The Michael Morpurgo library and study centre at West Buckland School is located on a beautiful rural campus near Barnstaple, Devon. The ground floor houses the library and provides IT resources, classrooms, a higher education and careers area and open plan study spaces. 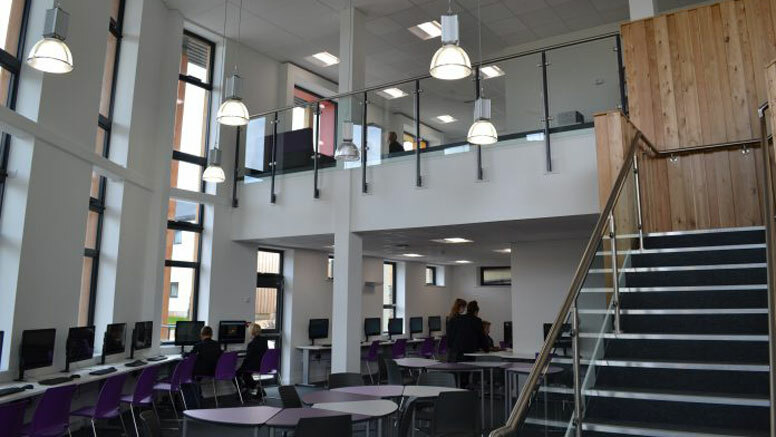 The upper floor provides study facilities dedicated for the use of Sixth Form students and creates the type of environment and ambience that the students are likely to encounter at university. Officially opened by Michael Morpurgo, OBE, the new library provides students with an exceptional learning environment. Our brief was to create a modern, inviting and motivating learning space. The white and oak clad interior has a true architectural feel. The high ceilings, a mezzanine and industrial-look pendant lighting give the library a light, bright contemporary vibe contrasting with its rural setting. It was therefore important to space plan the interior to maximise the architectural features while meeting all the individual and group demands of a high use, educational space.